Operation Brassard, the Invasion of Elba, gives an account of the role of the Royal Naval Beach Commandos in the invasion of Elba. They suffered heavy losses during the initial landings in the bay of Golfo di Campo but the main French invading successfully captured the island. Written by William McGrann in 2004. The circumstances leading to the death of my brother George McGrann, 60 years ago, while serving with the Royal Navy, have always been something of a mystery to my family. Secrecy was such a fundamental necessity during WW2 that my mother received only the barest details of his death. It wasn't until 1983 that some facts came to light with the publication of a book by Cecil Hampshire entitled 'Beachhead Commandos'. I had never heard of Naval Commandos, so, a few years ago, I decided to try to find out more. I believe that the following is a true account of the action, the circumstances surrounding my brother's death and the deaths of most of his comrades in that little known action. Their heroic feat was overshadowed by the main invasion of Normandy, which had taken place just 10 days previously and I feel that Operation Brassard deserves far greater recognition than it ever received at the time or since. George McGrann was born in Birkenhead on 20th March, 1926. 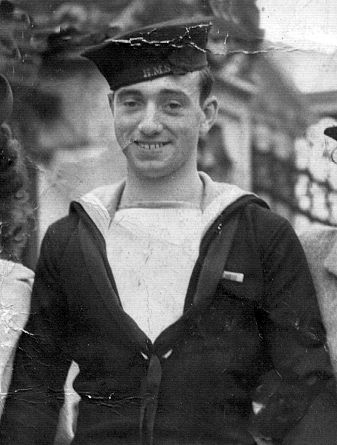 He falsified his birth certificate and in January 1943, age just 16 and very much against his mother's wishes, he volunteered for the Royal Navy. He was accepted and after a month's initial training at HMS Ganges, he volunteered for hazardous duty and was sent to HMS Armadillo, a Royal Naval training establishment on the banks of Loch Long at Ardentinny in Scotland. Here officers and men underwent arduous specialist training to become Royal Naval Commandos. Their motto of 'Imprimo Exulto' (first in, last out) aptly described their exploits on invasion beaches the world over. His training at 'Armadillo' coincided with that of 'O' commando but on completion, he became part of 'A' Commando to bring that unit back up to strength. Officers and men of the RN Commandos trained together, which, at the time, was a novel concept among military units. It helped turn them into an elite corps in the best traditions of the original British Commando. Besides their own exacting drills, they were expected to pass the Combined Operations Commando course at Achnacarry in Inverness-shire, before being presented with the coveted Green Beret and FS commando dagger. The legendary Colonel Vaughan, affectionately known as 'Rommel of the North' by his trainees, ruled supreme here. Such was his strict discipline that the RN classes, which passed through his hands, wryly assumed that he had a grievance against the Royal Navy in general and RN Commandos in particular! However, it was perfect groundwork for the testing times to come. My brother was then posted to Royal Naval Beach Commando (RNBC), Dartmouth, for a few weeks. Dartmouth had been taken over in 1943 by Combined Operations for training in small boat and landing craft handling. On completion of his training, he was sent to India, where he joined 'A' commando which, with 'O' Commando, were preparing for an assignment in the Far East against Japanese forces. For reasons unknown this operation was cancelled. 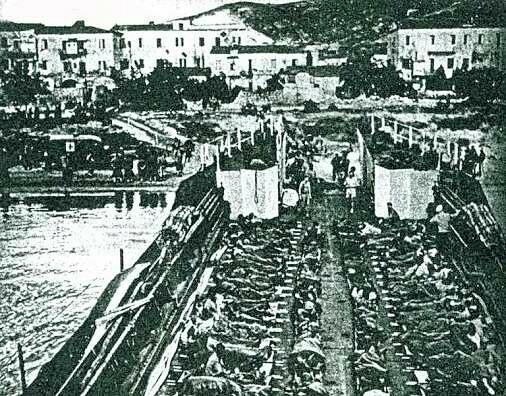 The whole of 'A' and 'O' Commandos were later dispatched to the Mediterranean to take part in Operation ‘Shingle’, the allied invasion of Anzio in January 1944. This was exactly the type of operation for which the RN Commandos had been trained. They landed on the beaches with the first wave of assault troops, maintaining order as wave upon wave of troops and supplies landed. They achieved this by clearing away obstacles, including mines and organising exits from the beaches to local roads and tracks inland. They kept massive amounts of men and materials flowing off the beaches to where they were most needed. After Anzio, 'A' and 'O' Commando found themselves in Corsica, training for an operation to invade and capture a German stronghold on a small island off the west coast of Italy - Elba. 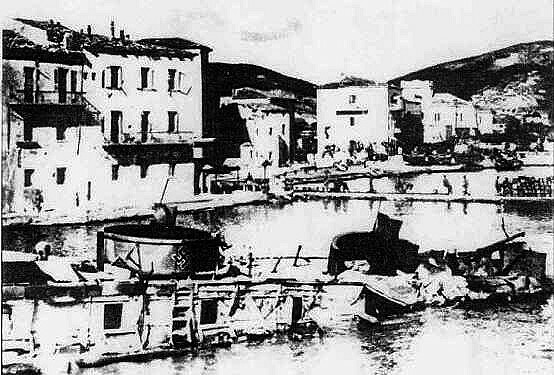 So began the preparations for the invasion of Elba. Planners had decided that this would be undertaken by the French 'B' army under the command of General de Latre de Tassigny. His forces consisted of the 9th Colonial Infantry Division, a battalion of French commandos and a battalion of Moroccan Goums. The French decided that 'surprise' was to be the order of the day and so there was no major air assault and no major bombardment. Unfortunately, most likely because of woeful security, surprise played no part in the operation at all. Rear-Admiral Troutbridge commanded the naval units involved and the C. in C. Mediterranean, Admiral Cunningham, was in overall command. Two sub units of the Royal Naval Beach Commandos were to be used for a specialist task on the main invasion beach. This task fell to Able 1 and Oboe 3 Commando with Able 2 in reserve. The whole operation was given the code word 'Brassard’ while the British Commandos part in the assault was code-named ‘Cut-out’. On the eve of the invasion, the senior petty officer of O3 Commando decided that the operation was likely to be exceptionally hazardous and ordered his two youngest Commandos (both 18) to remain behind on Corsica. Some experts felt that it was unnecessary to invade Elba, as the main thrust of the allied advance into Italy would eventually isolate the island. This would force a German evacuation or surrender without the need of a confrontation. 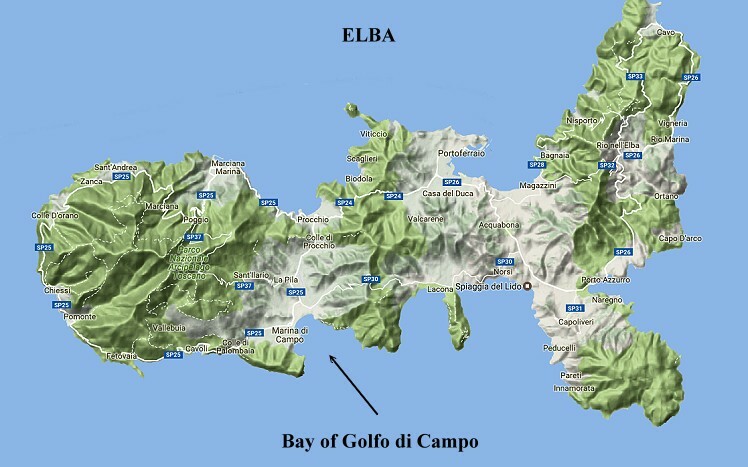 Elba was heavily fortified and the guns sited on top of the mountains threatened the sea-lanes surrounding the island. For whatever reason, the invasion was authorized and preparations and training took place on Corsica. There is a report that the C in C Mediterranean cancelled the original invasion date, because the French forces were not sufficiently prepared for the task. After further training, the operation was given the go-ahead. French Commandos were to undertake diversionary landings on other parts of the island and small naval units would be used to draw the attention of the defenders away from the main landing area. Douglas Fairbanks Junior, the film star, was the commander of an American P.T. boat. He took part in this action and the French awarded him the Croix de Guerre, with Palm, for his contribution to the operation. The bay of Golfo di Campo, on the south coast of Elba, forms a natural harbour. From the seaward side, the right coastline was heavily wooded and dropped steeply to the sea. A promontory split the left shoreline and acted as a natural breakwater, forming a perfect inner harbour for the old fishing village of Marina di Campo. It stretched past the promontory for about 400 yards. A quay ran the length of the village and roughly half way along the waterfront was a substantial 'L' shaped concrete jetty (or mole), the seaward side of which was bounded by a small reef of rocks. Further into the harbour, the shoreline flattened out and became gently sloping sandy beaches, sweeping right around the bay. This was the area chosen to land the bulk of the invading forces. The beaches were designated Red and Amber and were judged to be ideal to take the various types of landing craft. It was thought that the troops would be able to step ashore directly onto dry land only a few yards from the islands road system giving further rapid access to the remainder of the island. It was known that a heavily armed German Flak ship (gun-boat), the 'Koln', would be berthed on the leeward side of the jetty. This gave it a commanding view of Red and Amber beaches and its early capture or neutralisation was vital, since it posed a serious threat to the invading French troops. A1 Commando were assigned the task, while O3's job was to seal off and defend the jetty from any German counter-attack. Once captured and after all fighting had ceased, the 'Koln' was to be moved from the jetty to allow Allied supply ships to discharge their cargoes. The main assault was timed for 04.00 (H hour). At about 03.45, as the invasion fleet was nearing the bay, the Germans challenged the leading craft by light and receiving no reply, opened fire with their heavy guns, which were situated high on the cliffs either side of Golfo di Campo. As the landing craft entered the bay, the enemy increased the barrage from sites within the bay and from the guns on the 'Koln'. The guns from the invasion fleet and hundreds of rockets from the LCT(R)s answered, firing at the cliff top sites and into the bay and for some minutes forcing the Germans to keep their heads down. 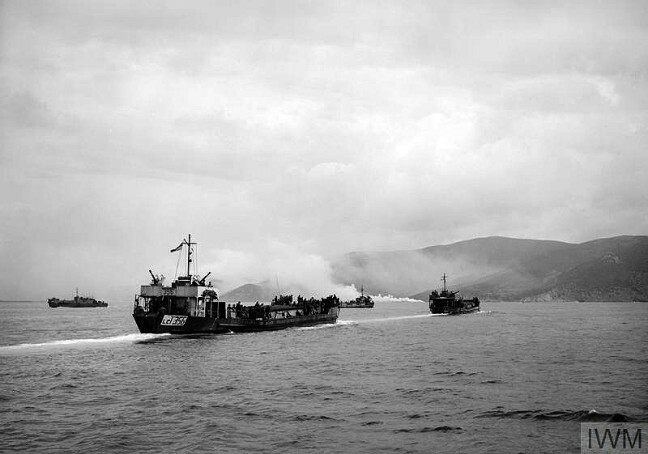 At H hour minus 10 minutes (0350), the two landing craft of the RN Commandos (LCA 576.6 with 24 members of 'Able' Commando led by Lieutenant Hodgson RNVR and LCA 576.1 carrying 'Oboe' Commando uner Lieutenant Harland RNVR) entered the bay of Marina di Campo and made for the jetty and the flak ship. Almost immediately, the defenders resumed their heavy barrage and it was a miracle that the LCAs managed to get close to their objective. With a few yards to go, LCA 576.6 was hit by enemy gunfire and one Commando was killed and three wounded. The LCA started to take in water and foundered on the rocks. LCA 576.1 managed to get alongside but was also hit by gunfire; three men were wounded. The remainder of 'A' Commando stormed ashore closely, followed by 'O' Commando using LCA 576.1 as a bridge. Once on the jetty, 'A' Commando boarded the Koln, forced a surrender from its crew and successfully carried out their part of the operation. 'O3' quickly consolidated their position on the jetty. They sited their Bren guns to cover any incursion from the village and shepherded the captured Germans onto the seaward end of the mole and, as previously agreed, waited for the French forces to overrun and occupy the village of Marina de Campo. 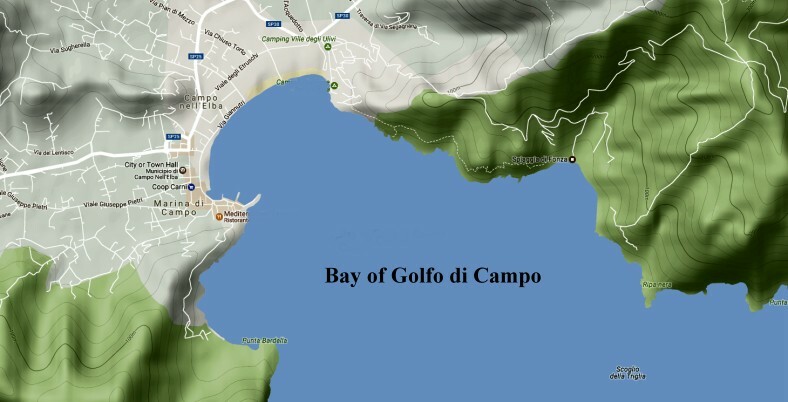 Unbeknown to the Commandos, the landings at Marino di Campo were aborted, because of the formidable German defences. It was many hours before the French cleared the village and relieved the pressure on the British forces. A small number of A2 Commando landed on the beaches and split into two groups. S/Lt. Godwin landed on Amber beach with his bodyguard and S/Lt Lock landed on Red beach. Once in place, they attempted to carry out their normal tasks of securing the landing beaches and guiding in the invading forces. S/Lt. Lock managed to guide in the vanguard of the first wave but, as LCI 132 beached, she was hit by gunfire. She tried to withdraw but caught fire and sank close inshore. LCI (L) 272 also received accurate enemy fire along with another landing craft, so he ceased guiding in and took cover with his men away from the shoreline. LCI (H) was fiercely engaging enemy gun positions off Red beach but was hopelessly outgunned. Another LCI, about to beach, was hit in quick succession by four mortar shells, killing the First Lieutenant and most of the ship's company. The troops, who were grouped forward, preparing to land were either killed or badly burned. The Commanding Officer left the bridge to direct the fight against the fire but was almost immediately mortally wounded in the head. LCI 272 received a direct hit on the port side of the well deck, then a further two shells landed amidships. LCI 132 was, by now, well alight, having been hit repeatedly. Native troops were pushed over the side or chose to jump into the water to escape the flames. At 04.35, a signal was received from LCI (L) 274 that Amber beach was under intense mortar fire and LCI (L) 303, leader of the second flight, reported "Second flight thwarted". After consultation with Colonel Chretian of the French forces, it was decided to withdraw from Marina de Campo. Had it not been for LCS (M) doing sterling work in making smoke, all five LCIs of the first wave would probably have been lost. Only 13 of the 18 LCAs, carrying troops to Amber beach, were counted as they departed. One LCA was seen blazing on Amber beach and one LCS (M) had run aground on rocks to the east of Amber. LCA 573 picked up survivors from her but, because of heavy enemy fire, had to withdraw, making smoke as she did so. The other LCAs could not be found. Meanwhile, back on the jetty with the 'Cut-out' party, the Commandos were joining the fight, engaging the enemy with small arms and the main armaments of the recently captured flak ship. During this phase of the landing, while under continuous artillery and sniper fire, the Commandos found insulated wires leading from the shore to the Mole. Suspecting that the jetty had been set with demolition charges, the wires were cut through. Despite this pre-emptive action, two massive demolition charges on the short leg of the mole exploded with devastating effect - it blew a 30 foot hole in the solid concrete structure. Such was the power of the explosion, that virtually everybody, Commando and prisoners of war alike, were killed. The blast forced the flak ship away from the jetty, where it caught fire and the onboard ammunition started to explode, adding to the general confusion. What caused the explosion will never be known with any degree of certainty. It is possible, that in the darkness some of the wires were missed or one of the main gun batteries in the hills, which found the range, made a direct hit. Whether by remote control or direct fire, the explosion was catastrophic for all those in the area at the time. Miles out to sea, the initial explosion was seen and heard by the follow-up French forces. It lit up the whole of the bay and the blast flattened everything in the vicinity of the quay and ripped the superstructure from the 'Koln'. Amongst the carnage on the upper deck of the flak-ship the bodies of two British naval ratings were found, still manning the 75mm gun. So great was the force of the explosion, that a number of ratings who were below deck, were also killed by the blast. ‘A’ Commando lost 20 Officers and men and ‘O’ Commando lost 18. The few survivors were either unconscious or injured. Lieutenant Lukin, in the undamaged LCA, was about 400 yards away picking up survivors from an LCT that had been hit. He bravely took his landing craft to the jetty and rescued as many of the injured as was physically possible. This included the crew of LCA 576.6, who had scrambled ashore and sheltered amongst the rocks when she sank. He managed to ferry them out of the Bay to a hospital ship. My father in law, Able Seaman Alfred Joseph Jeynes (Joe), C/JX 351290 (Northampton), was a member of the crew of an LCA that took part in the operation to liberate Elba. Joe is now 88 (Aug 2012) and still has a clear memory of that night in June 1944. This is his account as documented by his son in law, Brian Hartgrove. “In June 1944, I was aged 20 and coxswain of an LCA attached to HMS Royal Scotsman, anchored off Corsica. We were part of the Mediterranean fleet and had been involved in Operation Torch at Arzeu, Operation Husky in Sicily, “Avalanche” in Salerno and at Anzio. 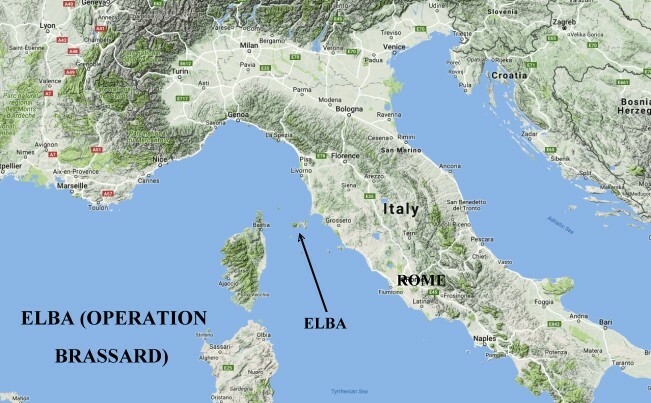 During preparations for the liberation of Elba, the Flotilla Officer, Lt. Harland, asked for volunteers from crews of LCAs to man 2 LCAs to take British Commandos to Elba. I volunteered, as did a number of my colleagues, including Peter Collier, Nobby Barnet and my best mate, Ken Beecher. Our task was to deliver the Commandos to a jetty in the harbour, where the Commandos were to neutralize a German flak ship moored on the leeward side of the jetty. Our 2 LCAs were towed across from Corsica until we got close to the harbour. We then powered up and made our run in to the jetty. I lay on the floor in the front of the boat with a grappling hook and line, ready to throw it onto the jetty to pull the LCA along side. However, before we arrived at the jetty, the Germans opened fire from the surrounding hills and from the Flak ship. Our LCA was hit and started to take in water and eventually we went aground on rocks some yards from the jetty. I dropped the ramp and opened the doors and the Commandos went into the water, climbed the jetty and stormed the Flak ship. When the Germans opened fire to repel the advancing troops, one of the Commandos, possibly an officer, who was close by me, was hit in the face by a hand grenade and I received shrapnel wounds. I pulled him into the water and headed for cover behind rocks alongside the jetty accompanied by Nobby Barnett. Despite my best efforts, the officer succumbed to his injuries. Around us the battle continued and I heard an almighty explosion as the Germans detonated mines on the jetty. The flak ship caught fire and further explosions were heard as its ammunition went up. With the Commandos disembarked, our job was done. We should then have left the harbour to make way for the LTIs (Landing Tank Infantry) carrying the main force of troops. However, both LCAs were out of action, so I remained in the relative safety of the rocks until, about 3 hours later, I was picked up (possibly) by an LCI (Landing Craft Infantry) and, together with injured Commandos, transferred to a hospital ship and then transported back to Bastia on Corsica. Joe was mentioned in dispatches for his actions that night - London Gazette November 7th 1944, Page 5089. Brian Hartgrove further writes; "Having read all the accounts myself, I am not sure which of the 2 LCAs Joe was on board, 576.1 or 576.6, also referred to as “Y” and “Z” in some accounts. In David Lee's book there is reference to a Sub Lieutenant Griffiths being killed by a grenade, as the assault craft were under the mole, which agrees with Joe's recollections but I can find no other references to Sub Lieutenant Griffiths. If anyone has information about this or the LCAs, I'd be grateful, if they would get in touch. We had no inkling that this task would be anything but easy but, as it unfolded, it turned into the worst landing I ever took part in. We passed through a small opening into the harbour, which was overlooked on both sides by high ground. A death trap if ever I saw one. I was terrified of the whole layout. As we entered the harbour, they commenced firing at us with everything they had. They poured phosphorous shells into the troop ships. The panic amongst the troops, especially the poor Senegalese, was total. They jumped or were pushed overboard to try to escape this frightening and diabolical weapon. The shore batteries continued to blast them with 88mm artillery. They hit them with every conceivable weapon, from every vantage point. I am convinced they knew exactly when and where the landings were to take place and, with typical German thoroughness, had prepared for it. After the initial landing, we picked up a few wounded commandos from the jetty and thankfully cleared the harbour and took them back to Corsica. That night saw a thousand and one acts of bravery which, I hope one day, will be told. For myself, I will never forget that so called 'easy landing'. The bravery awards for this action, in percentage terms, was the highest for any British naval action of the entire war. Sadly, the majority were posthumous. "The garrison of the island, we had been told, was under 800 Germans and reports spoke of their being preponderantly Poles and Czechs of low morale and all set for evacuation. In fact the ration strength was 2,600 Germans, who fought extremely well. The defences of Campo Bay were somewhat stronger than intelligence reports had led us to believe and, were in fact, extremely formidable. They had excavated caves in the granite cliffs flanking the beaches and installed 155 mm, 88mm and machine guns in them. Behind the beaches, exactly ranged on the likely places of disembarkation, were heavy mortars. had evacuated the civilians from the Village. 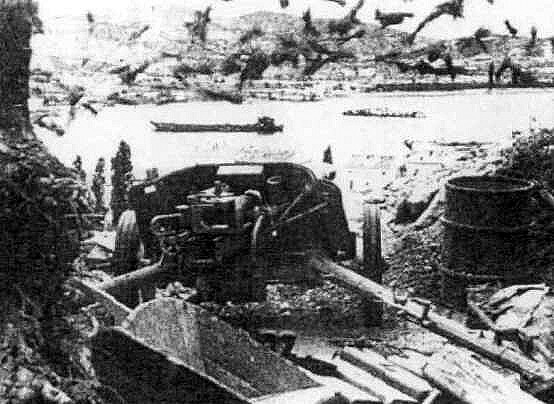 Official sources claim that the land mines on the jetty were exploded by German artillery from across the bay. We found a six barrelled rocket launcher (Nebelwerfer) on the hill above the village. It was aimed directly at the jetty and some barrels had been fired. Speaking to Cyril Woodhall, Ken Hatton and Jack Ball (all of O3 Commando) at a reunion years later, I was told that, as the two LCAs were approaching, the Germans on the jetty shouted that the British were expected." "In conclusion, it is to be appreciated, that it is difficult to give an accurate and cohesive report of such an action as this, fought in total darkness, relieved only by the light of gunfire and the flash of explosions. Eyewitness accounts are hard to obtain, as 47 out of the 48 commandos taking part, became casualties. Lastly, it is impossible to give an accurate chronological summary of events as time went unheeded in the heat of the action." "DEEPLY REGRET TO INFORM YOU THAT YOUR SON G MCGRANN C/JX407081 HAS BEEN KILLED ON WAR SERVICE ABROAD LETTER FOLLOWS SHORTLY = COMMODORE ROYAL NAVAL BARRACKS, CHATHAM." Along with his comrades, he was buried in the foreground of the small village graveyard in Marina di Campo. A memorial occupies the spot now. In 1947, the bodies of the Naval casualties were exhumed and taken to the Commonwealth War Cemetery amongst the vineyards overlooking Lake Bolsena in Italy. In the far right hand corner of the cemetery are two rows of headstones, all bearing the Naval anchor. These graves contain the remains of those young men who gave their lives so bravely on Elba early on Saturday morning, June 17th, 1944. At the end of the final row are six gravestones marked simply: KNOWN UNTO GOD. I'm writing in regards to the correspondence (below) about Desmond G O'Connor. My Uncle, Able Seaman Parsons C/JX.374660, is the person referred to in the Mentioned in Dispatches citation. As a young lad, my uncle Vic told me that his unit had boarded the German ship (Köln) which had been booby trapped by the Germans and next thing he knew was being blown up and recovering in hospital having been recovered from the water. His brother, Ken Parsons, (still alive aged 96) told me some years ago that Vic had been in the Mediterranean sea for some hours before being rescued. Vic's son is a best selling author and in his book 'Man and Boy (fiction), the main character's father is portrayed as a commando. I've been constructing my family history, including the Parsons line as Vic was my mother's brother. I hope to obtain a full copy of his service record which this account of Operation Brassard has prompted me to do sooner rather than later. I've learned a lot from the detailed account of what happened on that day, including some first hand recollections, which tally much more with what I was told many years ago. Desmond G O'Connor, RN Beach Commando, P/JX 608040. This information was received from Diarmuid O'Connor, nephew of Desmond O'Connor. On June 17th 1944 showed great gallantry and devotion to duty by pressing home the attack on the German "F" Lighter and later fiercely engaging enemy snipers at close range in an exposed position. When a heap of sacking at the end of the Mole caught fire, O'Connor and Able Seaman Parsons trampled it out despite being fully illuminated only fifty yards or so from enemy snipers. Killed in action. "Desmond was my father's only sibling and his loss was deeply felt. Although my father knew Desmond died at Elba, and was buried there, he never knew the full story. He knew he had been mentioned in dispatches but not why. He had always hoped someone from Desmond's past might be able to let him know, alas time is running out. We recently located his Mentioned in Dispatches citation in the National Archive at Kew but it was only when I rediscovered an old letter to dad from the Naval Manning Agency, that I noticed the name 'Operation Brassard.' It was while researching this essential title that led us to your Combined Operations website. I cannot overstate the importance of these discoveries to my father and my family. Please pass on our thanks to William McGrann. Personally I have only recently learned of the bravery and significance of the commando units and I had no idea my uncle was one of them! I would be delighted to hear from anyone who remembers him personally or better still has any photos." On this Website - Royal Naval Commandos and HDML 1301. The Beachhead Commandos by a Cecil Hampshire. Published by William Kimber & Co Ltd in 1983. If you have any information or book recommendations about Operation Brassard please contact us. 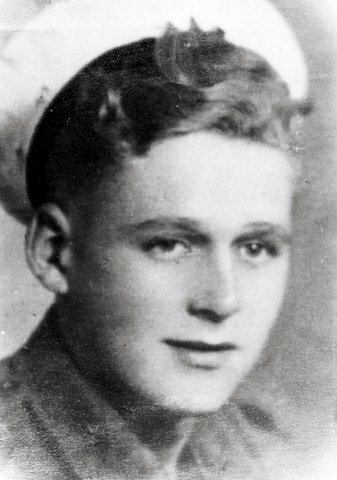 Operation Brassard, the Invasion of Elba, was written by William McGrann whose brother George was killed in the action.